NEO Tech headquartered in Chatsworth, CA, offers full product lifecycle engineering services, manufacturing and testing of microelectronics, cable & harness interconnect products, PCBA, full box build services and aftermarket repair and fulfillment services. Combining the strengths of three leading contract manufacturers: NATEL, EPIC, and OnCore, and with over 40 years of heritage in electronics manufacturing, NEO Tech focuses on low-medium-volume/high-mix, high-complexity products primarily in the medical, defense/aerospace and industrial markets. Neo Tech has manufacturing and engineering locations in California, Colorado, Illinois, Massachusetts, Nevada, Ohio, Mexico, and China. When Neo Tech was planning a move to a Westboro, MA facility, they were in need of new epoxy ESD flooring., meeting ANSI ESD S20.20 standards. The building required extensive flooring renovation, in order to meet their needs for electronics manufacturing. Joints were cracked and deteriorated, existing coatings were worn, and electrical properties were not functioning. They contacted E P Floors Corp., to perform a site analysis, and obtain recommendations for their esd floors, and provide a cost effective, long term solution for their facility. Different needs were evident, in different areas of the facility. Some areas were bare concrete, and required a two coat ESD coating. Others had an existing non esd coating. Also, there was a significant amount of work treating the expansion joints, due to cracking and breakage across the joints. The prep and joint repairs were completed first. This required saw cutting, chipping out the loose, unsound materials. Next, a 3 component epoxy mortar was applied to the surface, leveling and reinforcing the joints, and creating a smooth transition. The joints were then re cut, foam backer rod installed, and filled with flexible polyurea sealant. The next step, was diamond grinding surface prep of the entire project area, encompassing approximately 50,000 sq ft. This was performed in stages, to allow construction to continue in areas which were not being immediately treated. Once all areas were completely surface prepped, the ESD Floors were installed. This step included application of a high performance, vapor permeable, waterborne non ESD epoxy coating. Next, the final coat of urethane ESD flooring was applied. This finish layer had a light, non slip texture, yet was easily cleaned with mop or auto floor scrubber. This system is extremely low odor, and allowed Neo Tech to continue all other operations as usual,during the installation process. The resultant floor has an attractive, bright finish, with high abrasion resistance, durability, scuff resistance, and cleanability. The ESD flooring was installed on time, on budget, and resulted in accolades from Neo Tech. The two coat esd coating system has the added benefit of handling high vapor conditions in the concrete, without unbonding , bubbling or cracking. At the completion of the project, E P Floors Corp. tested the resistance of the flooring, and certified that all areas are in compliance with ANSI ESD S20.20-2014 standards (1 million to 35 million ohms). 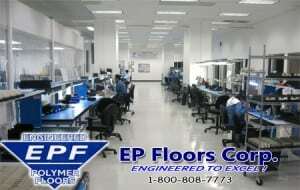 E P Floors Corp. is a vertically integrated flooring company, providing comprehensive consulting services and ESD & Conductive flooring solutions for electronics manufacturing facilities throughout the United States. 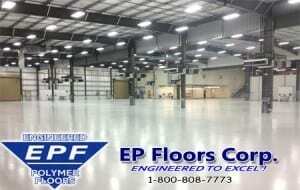 EPF provides a turn-key solution including materials, installation with their own crews, and a comprehensive five year warranty. E P Floors is certified by ISN, global leader in contractor and supply management review and verification systems (RAVS).